Staying active is vital for good health but not all kids enjoy participating in team sports. Fortunately, there are plenty of other activities that can help kids to develop strong, healthy bodies, so even kids who resist team sports can find an activity that they can love. Current recommendations call for at least 60 minutes of moderate to vigorous daily exercise for kids over two, with 90 minutes preferred. Additionally, kids need to remain moderately active between workouts, finding ways to keep their bodies moving while going about their daily activities. A generation ago, most children met or exceeded these guidelines, but today’s kids often fall short (sometimes very short) of the mark, spending many of their free hours pursuing sedentary pastimes such as watching videos or playing computer games. For kids who do participate in organised team sports, the regular schedule of practices and games can go a long way toward helping them meet their need for healthy exercise, but team sports are not the only option. Individual sports are plentiful and in some ways may be the most beneficial in keeping kids active in the long term. While few adults continue to actively enjoy the team sports that they played as kids, many individual sports provide lifelong pleasure and fitness to participants. As long as kids stay active, they will reap healthful benefits. Parents can try to convince their kids that cleaning and yard work can help them to stay healthy and fit (and they can! ), but it is the rare child who jumps at the chance to rake leaves simply because it can benefit their muscles and cardiovascular system. 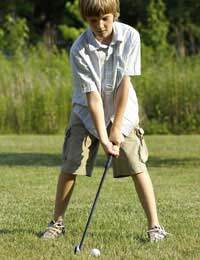 Most kids can find some types of sports or active games that they’ll find pleasurable if they are given opportunities to try. Ideally, kids will settle on several individual sports, each utilising different muscle groups so that when combined, the entire body gets a workout. For some kids, the reasons that they avoid team sports include shyness or the feeling that they cannot compete with their more athletic peers. Often, once these kids have had opportunities to build strength, stamina, and coordination by participating in individual sports, their confidence and self-esteem are given a boost, allowing them to express interest in joining an organised team. Sometimes, the skills that kids master individually can be of direct use in a team sport; for example, a child who learns to ice skate may consider joining a hockey team. While it is not a good idea for parents to insist that their kids participate in team sports, enrolling in activities with peers can help kids to develop socially, so if children express the desire to try, parents should offer their encouragement and support. It’s important to remember that every child is different, though, so whether children want to play for team, master individual sports, or do both, the most important thing is that they find ways to incorporate exercise and activity into their lives, making them happier and healthier people.